Hello crocheters! This is my first pattern, adapted from another hat pattern that just wouldn’t work with my yarn. It was made for a friend for the P-rade going on today. It’s a parade for the alumni of Princeton University. His dad is from 1982, so he marches. I thought we could both share our spirit with matching hats. I made mine from another pattern. Feel free to adapt to any school or sports team. Fits an average size head. (sorry, don’t know how to adapt to other head sizes! 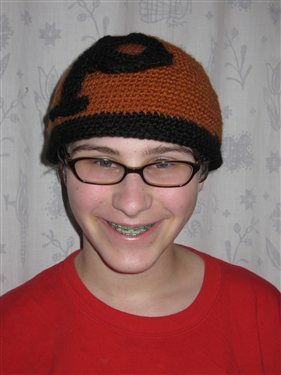 Try adding more rows) Hat will fit loosely on head – like a bucket hat. If not using the “P” made here, try to make your own letter. I figured this one out by drawing it…mess around, tell me how it works out. Rounds 6-10: Sc in each st around. Rounds 19 – 29: Sc in each st around. Slip stitch in first stitch. Fasten off. Continue row 4 until the shaft is 4.5 inches from the foundation chain. Fasten off. Row 13: sc2tog, sc across. Fasten off. With a yarn needle and CC yarn, sew the shaft to the round part. Sew to hat. Weave in ends. If you want to make a pompom (mine doesn’t have one, but it would look good with one), use a pompom maker or your fingers to make a pompom while holding the MC and the CC together. To make a pompom with your fingers, hold three fingers out and wind the yarn about 100 times around. Tie one piece of yarn around the middle. Secure well. Cut the loops and fluff. Trim ends to make them even. Let me know if there are any mistakes. I’d love feedback!